The beautifully built Mazzer Super Jolly Timer coffee grinder (also known as the model DL254) is perfect for moderate / high volume outlets and represents outstanding value for money. This model is supplied in silver. With a very powerful 350W motor turning at a very low speed of 1600 rpm, this grinder is quiet and powerful. 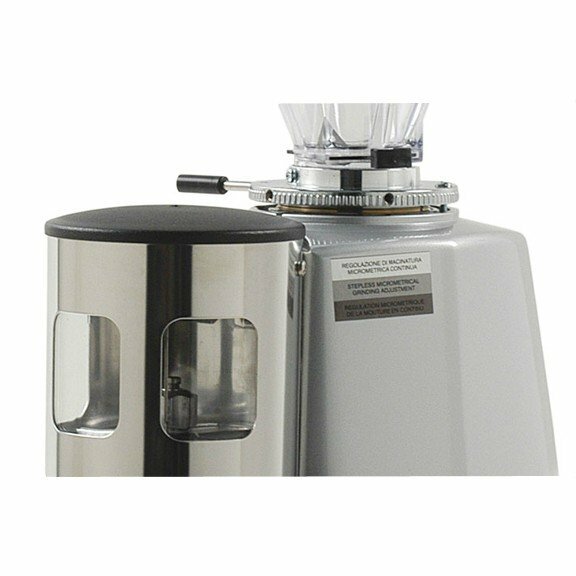 The large 64mm diameter burrs grind the coffee beans quickly, while the patented stepless grinding mechanism allows infinite grind adjustment. How Does A Mazzer Timer Grinder Work? The Mazzer Super Jolly Timer has a variable timer control wheel on the side. The machine will grind coffee for the period that the timer is running and stops when it returns to zero. This can be adjusted for your requirements. Weight - 14kgs. We are an official Mazzer grinder distributor and so our grinders are shipped out from our own stock. We are therefore able to offer the lowest UK prices. What Else Do I Need To Know About The Mazzer Super Jolly? The brilliant Mazzer Super Jolly was originally designed to be purely for commercial use. However, now that people are more knowledgeable about their coffee and definitely more discerning about what they drink at home, they’re now also purchased by coffee lovers who want a top-end grinder in their kitchen. Mazzer grinders are particularly well suited to home use as the infinite grind adjustment found on all Mazzer Super Jolly models is more than able to cope with anything from a fine espresso to the coarser grinds needed for cafetiere coffee. One of the other features that make it perfect for home use is that the powerful motor is very quiet, so it doesn’t feel like you’re using an industrial machine in your kitchen. As with all Mazzer units, the motor is extremely powerful and won’t bog down when placed under load, resulting in a longer working life and a more consistent grind too. Of course, this range of grinders is also perfectly suited to use in coffee shops, cafes and restaurants, where it will cope with any demands placed on it. The slightly larger body and more powerful motor (when compared to the Mini range) allow it to work all day long, week in week out. It is the smaller relation to the Mazzer Major models which are designed for heavier commercial use and are physically larger machines. The Mazzer Super Jolly espresso grinder weighs approximately 14 kilograms and is superbly engineered to ensure it will last a lifetime. The attractive finish and elegant design ensures it will take pride of place in your kitchen or coffee shop and be an investment you will be proud of. Please note that Mazzer grinders are tested at the factory in Italy and therefore some coffee grounds may occasionally be found in the grinder as a result. All machines sold are brand new and are factory sealed in their original boxes. The height of this grinder is approximately 610mm when using the 1.2kg hopper supplied, reducing to around 489mm when used with the smallest 320g hopper (available separately). If you need any further information, you can send us a contact message via the link at the top of this web page. The standard warranty for all Mazzer Grinders is a 12 months parts cover. This is a back to base warranty where you return the grinder for examination and repair. Should you prefer, we can send an engineer to attend the machine on site and this would be chargeable at the rate applicable at the time. Please report this by email to admin@coffeeworldgroup.com stating the symptom and any relevant information: We will then email you by return and advise what action will be taken. Under no circumstances should any item be returned to A1 Coffee without specific instruction from us. Unauthorised returns may invalidate the warranty. The details of the warranty specific to any piece of equipment are set out within the relevant product page within our web site www.a1coffee.net Any costs for labour will be passed on to the customer by A1 Coffee Limited as they are excluded from any warranty cover. This includes faults arising from inadequate or incorrect installation or incorrect assembly. Additionally, faults arising from problems with the machine location are not covered by any warranty. Examples would include a faulty electrical supply to the machine or any failure resulting directly from the machine location. The warranty also excludes faults arising from vandalism, negligence, or misuse. Where an engineer attends a machine callout and either no fault is found or the machine is operating within its’ specification the cost of the callout will be recharged to the customer. *Great Britain comprises mainland England, Wales, & Scotland. Northern Ireland and UK Islands are excluded. The upgraded warranty for all Mazzer Grinders is a 12 months onsite parts and labour cover. This is where the engineer will attend the Grinder at your premises for examination and repair. Please note that the engineer can only attend business premises and cannot visit residential properties. In the event of a fault: Please report this by email to admin@coffeeworldgroup.com stating the symptom and any relevant information: We will then email you by return and advise what action will be taken. The details of the warranty specific to any piece of equipment are set out within the relevant product page within our web site www.a1coffee.net This upgraded warranty covers all costs associated in the event of a machine or part failure. This excludes faults arising from inadequate or incorrect installation or incorrect assembly, faults arising from incorrect operation of the Grinder and faults arising from problems with the machine location. For examples a faulty electrical supply to the machine or any failure resulting directly from the machine location. Where an engineer attends a machine callout and either no fault is found or the machine is operating within its’ specification the cost of the callout will be recharged to the customer. The warranty also does not include faults arising from vandalism, negligence, or misuse. Please allow up to 5 days (Monday-Saturday, excluding public holidays) for deliveries via Royal Mail/Courier. Only available on certain smaller non-fragile items. Orders must be placed before 4pm. Orders placed after 4pm on a Friday, weekend or Bank Holiday will be processed the next working day. Please note that a signature is required on delivery.